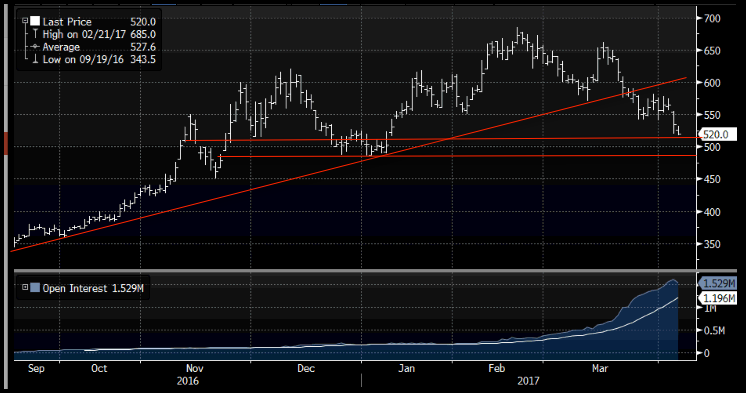 The Dalian iron ore futures recently completed a technical top formation / closed below key support on 27/3/17 at 566 thereby generating a technical sell signal as detailed in this recent Wire. This was the first technical trend change in the iron ore price since the buy signal was originally generated back in January 2016. The minimum nominated downside technical target located at 516 was reached yesterday. It is important to note, the iron ore price technicals remain negative given there is no sign of base forming emerging. Major subsequent support is now located at 486.